Last Updated: July 12, 2016 | Subscribe to our weekly newsletter! Chlorine isn’t for everyone and some of us are even allergic to it. Sure, it is a great way to clean a pool, but for some it can really ruin a swim experience. The chemical smell, skin irritation and burning eyes that can come from a chlorine pool is enough to discourage even the most dedicated of swimmers. There are alternatives to chlorine for your pool. Let’s explore some of the best alternatives to chlorine for your pool so you can get away from using the harsh chemical that irritates your skin and eyes every time you take a dive into your pool. First, I want to briefly mention bromine as an alternative. It is really not all that different from chlorine, as it is just another chemical compound, but it is a great sanitizer that will work well especially for those that are allergic to chlorine. While it is a great sanitizer, it is not as great at oxidizing as chlorine. This means that it won’t clear your water quite as well. In order to combat this, many pool owners use a hybrid system that uses both bromine and chlorine. That means it isn’t a great solution if you are looking to eliminate your dependence on chlorine for sanitation. Still, it is easy to use and great at warmer temperatures as well. This makes it a great solution for hot tub owners and pool owners in warm climates. If you want to completely eliminate your dependence on chlorine, then you should look at PHMB. PHMB is short for polyhexamethylene biguanide. This is commonly sold as Baquacil in stores. Now that’s a name you are probably more familiar with than PHMB. This is simply an alternative compound you can put in your water in place of chlorine and it will do all the work for you. However, this chemical does not oxidize your water at all. You will have to use hydrogen peroxide for this and you will even need to add a separate algaecide as well in order to make sure you water remains clear. You have all heard of the ozone layer in our atmosphere that filters out the sun’s dangerous rays. In much the same process, you can create your very own ozone layer in your pool, so to speak. The process inserts ozone gas into the pool. This gas then reacts with any impurities it comes into contact with in your pool. This reaction then cleans the pools and makes the water perfectly safe for swimming. In the UV light system, special lamps are installed on the water return lines that kill all the nastiness in the water before returning to the pool. Corona discharge, on the other hand, use an electrical arc to create ozone inside the generator to kill the pathogens inside the filtration system itself. While both of these systems are very effective, there is one small problem. They function best in dry climates. If your live in a humid area, the performance of one of these systems will be reduced meaning you may have to fall back on a little chlorine every now and again. One of the most effective ozonators that we recommend is the Jandy Pro Series Ozone Generator. This corona discharge system is pretty easy to install in your existing pool and even easier to use. The system itself is very energy efficient and will keep your water clean with very little effort on your part. If you are considering an ozone generator, we here at Swim University do believe this system will be the best option for you right now. If you would like your pool to be a little more eco-friendly, and who doesn’t in these days of trying to live green, then you may want to consider natural mineral sanitizer for your pool. Natural mineral sanitizers are much more environmentally friendly and will help you reduce your dependence on artificial chemicals as a cleaning agent in your pool. These sanitizers are devices that provide a steady stream of metallic ions to the water in your pool. These ions then react with algae and bacteria in the water stopping them in their tracks. In a properly balanced system, the addition of these ions should have very little effect on the overall chemistry of your pool, so you shouldn’t have to worry about any type of buildup occurring on your pool’s filtration system or sides. Now if you noticed above I did say that it will reduce your dependency on chlorine. It won’t, however, eliminate it completely. Still, it is a great way to be much more environmentally friendly with your pool and you will greatly reduce how much you have to invest in chlorine supplies during the swimming season. One of our favorite natural mineral sanitizers currently on the market is the Nature2 Mineral Sanitizer. This sanitizer releases silver and copper ions into the water after it is connected to your pool’s filtration system. These then seek out those pesky bacteria and destroy them before they have a chance to grow or thrive in your pool’s water. This system will reduce your dependency on chlorine by as much as 50% while still keeping your water clean and without impacting the chemical balance of your water. If you want to go green with your pool care, then the Nature2 system could be the best option for you. All of these are great alternatives to chlorine for your pool. They will clean your water and keep it safe for swimming all summer long. But, like any sanitizing system, be sure you read and follow the instructions carefully. As these systems are different from traditional chlorine, there will be a learning curve, and you want to make sure you do everything just right so you can be sure your water is clean, clear and safe for summer swimming. Practicing proper pool chemistry and important and easy. 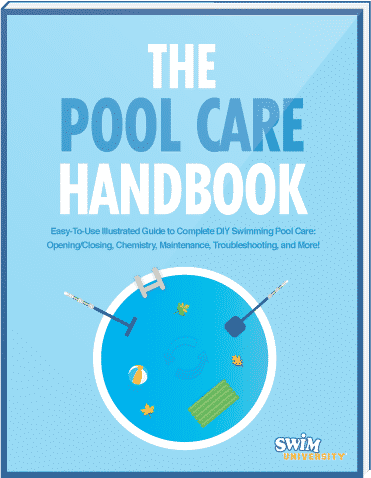 In this guide, I'll provide you everything you need to know to keep your pool clean and clear. I compiled every money saving tips for your pool I've given to customers over the past 20 years of teaching pool maintenance. Start saving money now! Muriatic acid is an inexpensive way to lower your pool's alkalinity, but watch out. Handling the acid incorrectly could have explosive results. Literally. Does the type of pool shock you use make a difference? If you're not using calcium hypochlorite to shock your pool, you may want to reconsider your choice. Is your water too hard or too soft? Learn what you need to do to lower the calcium hardness level in your pool so you don't get buildup in your pool. Pool care entails a lot of little details. It's easy to forget one or two of them from time to time. Luckily, all pool maintenance mistakes are fixable.